The Syagrus romanzoffiana or Queen Palm has a stout trunk and elegant crown of plumose leaves. The Queen Palm is a common and familiar sight in streets, gardens and parks in milder climates around the world. Queen Palms grow fast and require frequent fertilization to maintain a healthy appearance. 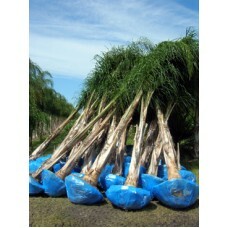 The Queen palm is rated for Zone 9 and can be planted in micro-climates of Zone 8b. The Syagrus romanzoffiana or Queen Palm has a stout trunk and elegant crown of plumose leaves. &nb..